There are few details about the ebook market in 2013 that baffle me, and Sony's continued presence is one of them. Sony has just announced that they have expanded the Sony Reader Store. 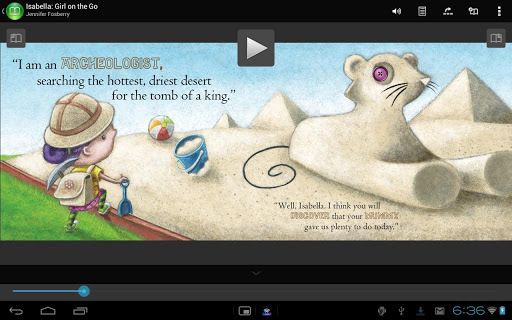 The new Kid's Corner features ebooks with enhanced content and rich graphics, and Sony boasts that the new ebook selection relies on Epub3, the new ebook format which is still only partially supported in the ebook market. The ebooks require the new version of the Sony Reader for Android app which Sony released just a couple weeks ago. They cannot be read on the Sony Reader iOS app, PC app, or on the Sony Reader (T1, T2, or earlier models). Luckily most of the content can be found in other ebookstores, including the Kindle Store, Nook Kids, and elsewhere. I checked a half dozen titles and all were available elsewhere. While it is true that Sony is slightly ahead of the pack in adopting Epub3, they are also a couple steps behind in offering content. The reason Sony baffles me is that I don't understand their ongoing investment in ebooks. Sure, I can see why they released a disappointing ereader last fall; hardware is cool, even a money- losing trophy like the Sony Reader. And I can understand why they are slowly expanding their ebookstore to more countries (most recently Germany), but I don't understand the Epub3 support. Sony developed the new Android app in-house, and the same goes for the new ebookstore section. Developing the app is no small expense, and I don't see how they would recoup the cost by selling ebooks. Their ebook market share simply is not large enough; in fact it is widely estimated to be a fraction of a percent. I am not saying that Sony's actions are right, wrong, smart, or foolish. I used to think Sony was a ship of fools, yes, but now that they have made multiple inexplicable announcements I don't know what is going on. All I can say at this point is that Sony bears watching. They could be up to something interesting. Sony continues to baffle. After all of this, they still have a fraction of a % of market share. > Developing the app is no small expense, and I don’t see how they would recoup the cost by selling ebooks. Nate, why do you think so? I work in software and out of thin air estimate would be hardly more than 20 man-months. Say $200K, it’s a pocket change for Sony. Licensing content from other side, it’s where big bucks are spent. Promotion can cost them good too. Comparing to these developing an Android app using standard libraries is not much of achievement. Given they have all the back office / server side services already implemented. These would require some changes, but it’s on the same scale. Also I bet Sony has in house soft-dev dept so they are paying them anyway 🙂 . But why spend it at all? The same reason they buy ebooks at full price to sell for 20p in the UK. They think they still matter in the ebook business.